Notes sent to me by Mrs Patricia Geatches (née Kidd), their daughter, on 31st January 2003. 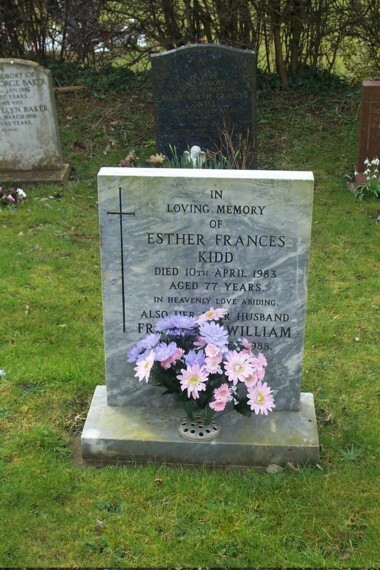 My parents moved from Bury St Edmunds to Elmswell in 1942, I was one year old. We moved to Oak Lane, Elmswell, sometimes called Stubbins Lane also. We moved into farm cottages belonging to Mr Barker and then Mr Godbold, farmer in Elmswell, the farm near Cattons garage. Not sure of name of road. My father was a horseman then later drove a tractor. Toward the end of his working life he worked at the Bacon Factory. When retired he worked for Mr Macdonald of the Grange as groundsman, tidying the hedges and grass etc. My mother went to the Womens meetings at the Baptist Church also the Methodist Womens meetings. She enjoyed visiting people. As a child I remember her visiting Mrs Roper who lived at Ashfield Road near Tate Lyle, also Mrs Borley who lived in a farm opposite Oak Lane, we used to get eggs from her. My mother liked being outdoor in the summer and used to take me and another friend Mrs Theobold who lived at Dagwood Farm Ashfield Road with her children Mary and Bill for a picnic up on the old airodrome field, mum always made a jelly and took that with sandwichs. I used to walk to school everyday from Oak Lane. When I was 5 years old my mother sent me to C of E Sunday School held in the Old School hall near the school. Grace Goddard was a teacher at Sunday school as well as Day school, I walked to Sunday school with Grace Goddard as she lived in Ashfield Road near to us. When I was older I went to the Baptist Church and later became a Sunday school teacher, my son Mark now teaches at the church and writes in Elmswell Magazine for the Baptists. As a child I used to help Mr Harry Pearson in the harvest fields, he used to farm in Ashfield road, sorry cannot remember the name of the farm. I used to play on the old aerodrome at the top of Oak Lane, I used to drag lots of silver paper down the lane and got into trouble for making a mess. I played with Terry Ball, his parents had a garage at the bottom of Oak Lane. Once we made a den in a tree and painted the tree bright green and put a radio in it. I love Elmswell and anything to do with it in the past. When I left school I went to work at Hawes the Printers as a bookbinder. My parents used to entertain americans at Christmas when they were at the airodrome, I can only remember sitting on a gate and saying to the americans ‘ got any gum chum’. My father used to play darts at the Fox, he also enjoyed watching Elmswell Football Club. 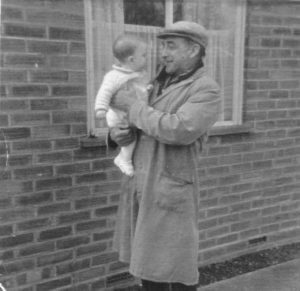 Fred Kidd with grandson Mark Partridge, who writes in Elmswell Magazine for Baptists, 1966 at Fred’s house in Thedwastre Close Elmswell. 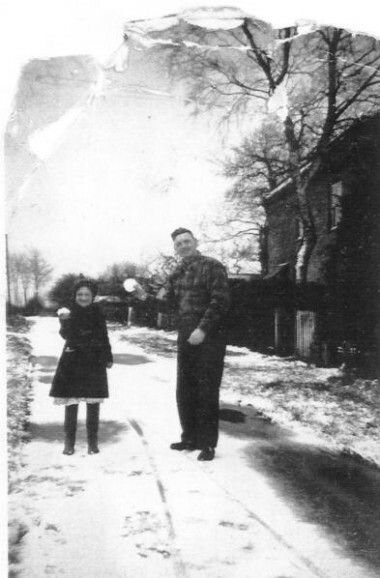 Patrica Kidd in Oak Lane, with Mr Armstrong, the late Bill Armstrong’s brother from Australia, who lived in Oak Lane for a short time, Year approx 1949. 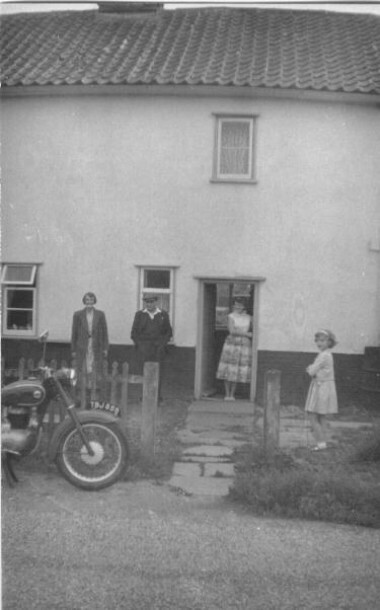 Mr and Mrs Kidd outside their house in Oak Lane, with daughter Pat and Ann Rudland, daughter of Mr and Mrs C Rudland. year approx 1956? 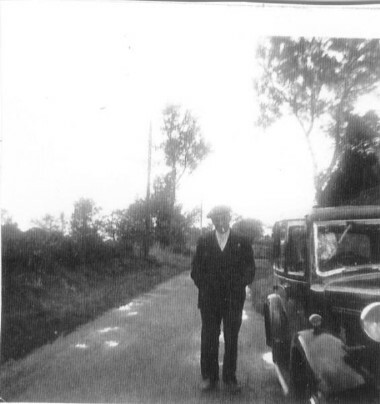 Fred Kidd Oak Lane, approx 1947.